Ever since the out of left-field Brain-Age series and other non-games hit the DS, Nintendo reconstituted what potential audiences existed with its Blue Ocean strategy. Two years later, a substantial number of DS owners are the same people who were inducted through these games - the Brain-Age crowd. While the success of non-games such as New York Times Crosswords or Sudoku titles isn't anything to scoff at, a one-trick pony can only go so far. Fortunately 2008 is shaping up to be a year of change in the gaming world. Professor Layton and the Curious Village provides the missing link between the brain-training fad and a proper story in what is shaping up to be one of the most enjoyable, if not prettiest, adventure games on the DS yet. Warmly-received in Japan last year, the game is the first in a trilogy which follows the adventures of the archaeologist Professor Layton and his assistant Luke as they solve mysteries through puzzle-solving methods. The first thing many will notice about the title is its cozy art style, which echoes Triplets of Belleville and some older Miyazaki films, and is maintained for the game's fantasitcally-animated cutscenes and dialog sets. While Level 5 has certainly done a great job in grabbing our attention with Curious Village's distinct style, a pretty face doesn't make a blonde smart, as they say. Of course, this is where the gameplay comes in. 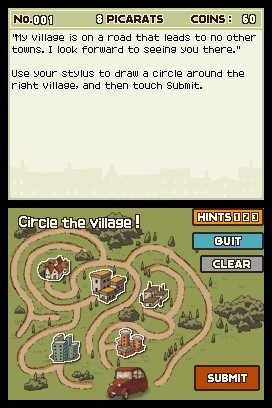 A collection of puzzles, riddles, and other logic-based problems, Professor Layton's gameplay is built around solving these puzzles to advance the plot. A healthy amount of interest in Curious Village has stemmed from these puzzles, which have been overseen by Akira Toga, a psychologist and author of the best-selling Atama no Taisou (Exercising the Mind) books in Japan. While the puzzles range from a fairly easy difficulty (such as the variation of the "cannibals and missionaries" puzzle on the game's website) to extremely trying, the experience never gets too frustrating thanks to an unlimited number of retries, as well as a built-in hints system. 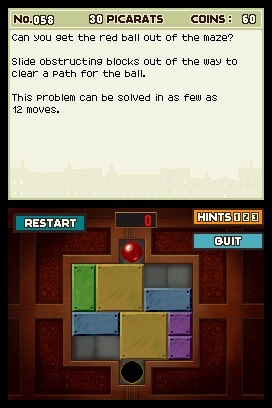 In theory, it's like Puzzle Quest is to Bejeweled, in that Professor Layton seems to have successfully combined a simple and successful idea (logic-based puzzles) with an aging genre (adventure games). It aims for the self-help crowd with a unique art style, and gameplay that rewards players for their troubles - wrapping everything up into a nice little Sherlock Holmes-style package. Although the game hasn't hit American shelves yet, its sequel has already been released overseas and the third game is in development. The combination of a mystery-driven story featuring a cast of cutesy characters and brain-bending problems may ring in a solid adventure game series, but it's leaving American journalists with another title in which "quirky" and "Japanese" are the most commonly-used terms to begin describing it. Currently slated for a February 10 release, only time will tell whether or not Professor Layton will arrive as a cult hit or overnight sensation, but with a track record like Level 5's recent Rouge Galaxy and Jeanne D'arc, there seems to be a bright future ahead for this Layton guy people are talking up. Mario races, stomps goombas and teams with Luigi in this special best of. This creepy visual novel didn't get nearly enough attention. Be the best princess you can be and dance your heart out!